Powered by NFR Communications, Inc.
God in every occupation means purpose for every job — even yours! After reaching a certain level of career success, are you now wondering if this is all there is? Are you serious about living your faith but findng it difficult to integrate your faith life with your work life? 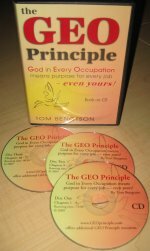 The premise of The GEO Principle is that you, your employer and the world would be better off if everyone brought God to their occupations. You do not need to leave God at home on Monday morning when you go to work. Just as God has a place in your heart, he has a place at the center of the commerical arena, despite its competitive, secular characteristics. 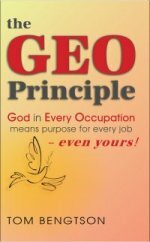 The GEO Principle look at the purpose of work, the characteristics of suitable employement, the meaning and importance of the Sabbath, what scripture has to say about work, strategies for sharing your faith on the job, and the new ways to look at the years typically devoted to retirement. Each chapter concludes with study questions and proposed action steps. 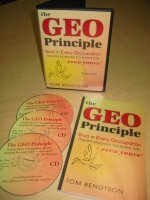 Order your copy of The GEO Principle today. The book retails for $11.99 but can be purchased through this website for $9.99 plus shipping. Make an investment in your future — both near-term and eternal. "I found this book very useful and full of ideas for bringing God into the workplace. I think it would be excellent for a discussion group of both men and women. It is an attractive book with a good cover and the chapters are well organized. I especially like the discussion questions and the action steps. Often writers stop with the discussion questions, but your action steps give concrete examples of ways in which we might change our lives or help others to change theirs." 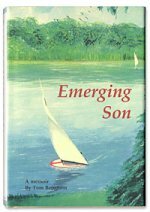 “Emerging Son” is an autobiographical memoir about a man’s journey to a purposeful midlife from youthful uncertainty. The author’s quest to recreate the happiness of his youth takes him from the newsroom to the courtroom as he launches a career, from the Midwest to Rome as he deepens his faith, and to South America as he builds a family. Tom Bengtson looks to his father as an example but ultimately discovers he has to look within himself for answers to life’s questions about faith, family and work. The book retails for $21.00 plus shipping. This three-CD Audio Book is recorded entirely by Author Tom Bengtson. 193 minute run time. This Audio Book retails for $14.99 plus shipping. This book/CD combo makes the perfect gift. Listen to the recording and keep the book close at hand for on-going reference. The Book/CD combo retails for $21.00 plus shipping. The Best Value! This 10-pack is perfect for study groups. The 10-pack retails for $79.99 plus shipping. 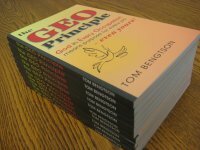 Note: For book orders of 50 or more copies of The GEO Principle, please call 952-835-2275 for special bulk pricing and shipping arrangements.